Happy Friday everyone! 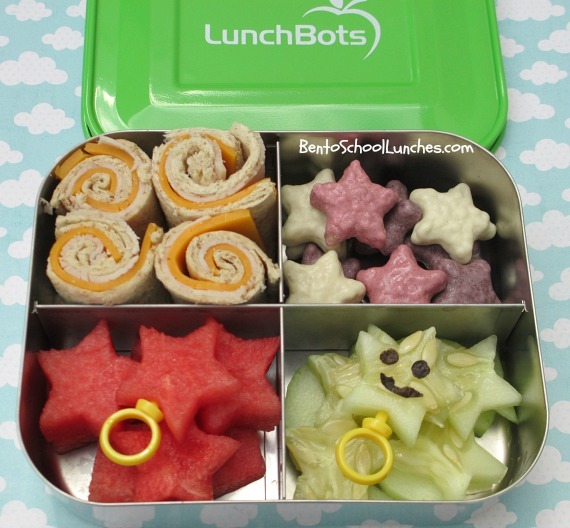 Roll-Ups or as some people call them pinwheels, are possibly the easiest bento to prepare. I sometimes use tortilla or just flatten out any bread that we have on hand, layer the other stuff on, roll it up and cut as desired! Our LunchBots Quad makes it easy to keep everything separated. Roll-ups using whole wheat bread and flattened with a rolling pin. Star shaped cucumber slices, nori eyes and mouth. Packed in our LunchBots Quad. Here are the supplies or similar that I used to make and pack this snack. Looks yummy and I like your stainless steel lunch box!